"We GSP (Generalised System of choice) to be held in Washington on November 23 after a meeting TICFA benefit expect to get back. Bangladesh high on the agenda of the GSP will keep the issue," Commerce Minister Tofail Ahmed said. Secretariat at Dhaka Marcia Stephens Bloom Bernicat press conference with the US ambassador to the United TICFA disclose the date of the meeting, while he commented. Bangladesh Commerce Minister TICFA meeting will demand the restoration of GSP. Senior Commerce Secretary Hedayetullah Al Mamoon TICFA will lead the Bangladesh delegation to the meeting. "We ensure the rights of workers to improve working conditions and labor law reform. Working environment is very sound. GSP to get back no reason to see any obstacle," Tofail GSP TICFA's success and said that implementation depends. Bangladesh Trade and Investment Support Forum Agreement (TICFA) agreement was signed by the Secretary of Commerce in Bangladesh (former) Mehboob Ahmed and in 2013, Deputy US Trade Representative Wendy Cutler. TICFA both business and government to discuss the issue of investment and cooperation to provide a procedure. Bangladesh Commerce Minister mega trans- Pacific Partnership (TPP) agreement to include the country will discuss issues such as expected. US-led 12-nation TPP was signed last month. Bangladesh's exports to the United States, because of the quality of clothing products after the suspension of the GSP is to maintain a steady growth rate, the minister said. 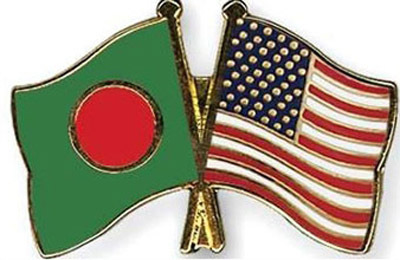 During the July-October period, US exports of Bangladesh to the same period of last year to 17 per cent, to $ 1.98 billion. Briefing on the matter, while US Ambassador worker has been significant progress in terms of security, there is, as Bangladesh could receive GSP benefits. On security issues, Bernicat safety issues are very close partners ". We take safety issues very carefully're working. We also address the issue of safety in future work Will You Be There. " Bangladesh on the US market, export growth rate is robust and GSP TICFA will be on the agenda of the meeting, and some products like pharmaceuticals is a good potential as future export potential of the country will also be discussed at the meeting In the future for America. "We also strengthen two-way trade'll talk about. We can increase trade in both ways. We have shared values and America is a friend of Bangladesh, the partner country," Bernicat. He is enthusiastic business partners and development partners and Bangladesh will be able to obtain GSP eligibility mentioned that.